Why travel to Suriname: The former Dutch colony now run by a drug-running dictator is trying to attract tourists. Why Would Anyone Go to Suriname? That’s what I went there to find out. 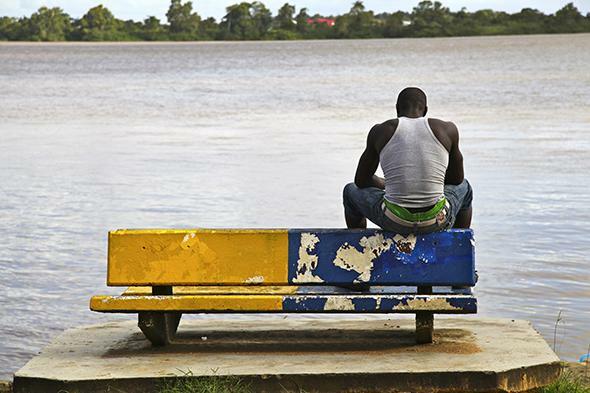 A man sits along the banks of the Suriname River in the capital city of Paramaribo. Each Friday, Roads & Kingdoms and Slate publish a new dispatch from around the globe. For more foreign correspondence mixed with food, war, travel, and photography, visit their online magazine or follow @roadskingdoms on Twitter. PARAMARIBO, Suriname—A president accused of murder and convicted for drug smuggling. Rogue gold miners and outlaw timber harvesters, most of them foreigners drawn to the lawlessness. Roads that end two hours outside the capital, leaving travelers with the choice of either taking handmade canoes through rivers infested with anacondas, piranhas, and giardia or flying on prop planes with alarming safety records. Why would anyone want to go to Suriname? That’s what I traveled there to find out. Actually, I had been invited by the recently formed Suriname Tourism Foundation, who had seen some of the consulting I did with the Belize Tourism Board a couple years ago. Like Belize, they wanted advice on how to best reach prospective travelers. With the number of Dutch tourists declining each year—Suriname is a former colony of the Netherlands—the country is eager to tap into new markets, and North Americans are, geographically and financially, the demographic most likely to take a chance on the smallest country in South America. I didn’t have much time to do research before heading to Paramaribo. But I can say this: The top Google search for Suriname is, “Where is Suriname?” That’s a tough start. Suriname, it turns out, is a knuckle on northern South America’s fist, squeezed between other lesser-knowns, Guyana and French Guyana, the continent’s non-Latin nations. The country is a regional anomaly: neither Spanish nor Portuguese in language and tradition like its South American neighbors, nor French like its Caribbean ones. It is a postcolonial state, although not wholly Dutch, either. There is a cruel truth about most of the great tourist destinations in the Americas: They are built on old barbarities of one kind or the other. The highest point from a now-bucolic hill in Managua, Nicaragua, is where Anastasio Somoza’s lackeys threw rebels down a chute into alligator infested waters. They also dropped regime enemies from helicopters into an active volcano, where tourists line up today for photos. Chile’s national stadium doubled as an enormous torture center. In my home state of South Carolina, visitors love to walk plantation grounds that were essentially the sites of a centuries-long reign of terror against slaves. In Paramaribo, the equivalent landmark might be Fort Zeelandia. A five-minute walk from my hotel, it is the centerpiece of historic Suriname. It was built in the 1600s, and is the oldest monumental building in the capital. And, as the sign in front admits, the fort “has also been the backdrop for some gruesome events.” Those events don’t just include the senseless execution of slaves a century ago. They are also referring to a bloody event from 1982—the so-called December Murders. That’s the difference between Suriname and many other places—usually such grisly sites don’t become tourist destinations until the people responsible are either dead or punished. But how do you build tourism off your dark history when the man responsible for the most disturbing chapter in modern Suriname is not just alive, but the president. 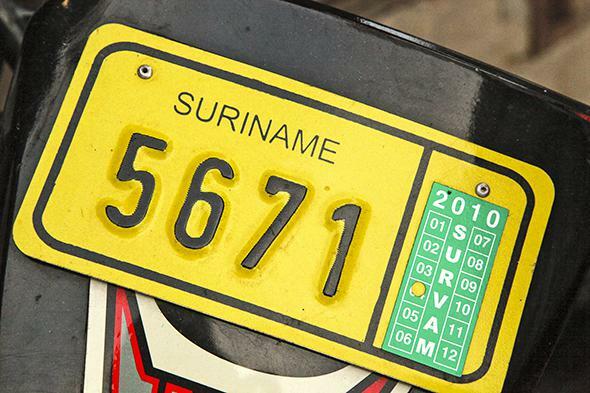 A license plate on a motorcycle, a popular way to get around. In December 1982, Desi Bouterse had been president for nearly three years, a position he had claimed for himself in a military coup. He had managed, as most dictators do, to quell opposition by eliminating political parties, controlling the media, instituting a curfew, and limiting opportunities for public assembly. Yet Bouterse still had critics. So on the morning of Dec. 7, 1982, 15 dissidents—most of them respected journalists or university professors—were rounded up and brought to Fort Zeelandia. Two days later, they were dead. Bouterse had allegedly ordered their torture and killing. According to a witness, Bouterse was the triggerman for two of the murders. Bouterse is a wanted man for these and other crimes. Europol has had a warrant for his arrest since 1999, after the Netherlands convicted him in absentia of smuggling more than 1,000 pounds of cocaine into the country. The conviction, which could not be enforced since Suriname has no extradition treaty with the Netherlands and Bouterse has legal immunity as president, has apparently done little to discourage Bouterse from maintaining strong ties with other traffickers, including his son, Dino Bouterse. Nor has Bouterse allowed the warrant to keep him homebound. Just last month he traveled to South Africa to attend Nelson Mandela’s funeral. Paramaribo’s streets do nothing to tip you off to the president’s history or the political and social drama he has created. No trucks of police or soldiers with machine guns roll down the street. There isn’t an unusual amount of security around government offices. The air doesn’t feel tense. Paramaribo isn’t a remarkable world capital, but it’s pleasant enough—a place where you could enjoy the warm weather, take a boat ride along the river, and down a beer or two in one of the city’s nothing-to-write-home-about restaurants. 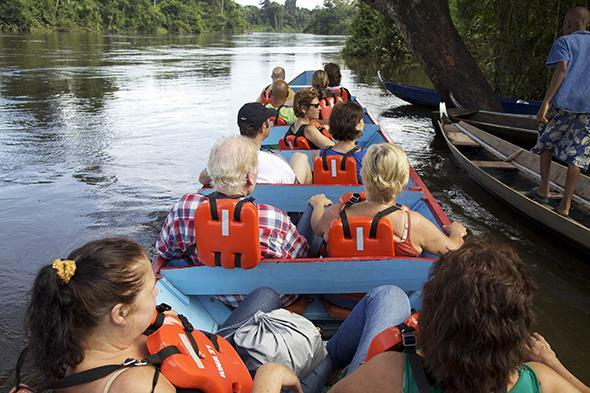 A boat of tourists, most from the Netherlands, prepares for their river transfer to a lodge in an Afro-Surinamese community on the banks of the Gran Rio River. Until now, the fact that the country is headed by a cocaine-trafficking fugitive accused of murder hasn’t hurt Suriname’s tourism—there simply wasn’t much tourism to speak of. But in an age where more travelers are wired, it’s inevitable that tourists who find themselves considering Suriname will also find themselves questioning whether it’s worth visiting a country where a dictator so overtly flouts the law. It’s little surprise that the government has decided it needs a robust marketing campaign to convince people to hop on the next flight to Paramaribo. Some Surinamese, though, aren’t waiting to see if the glossy brochures work. Ethnic groups in the country’s wild interior, long marginalized politically and economically, have been spearheading their own tourism services, and are seeing surprising success. Both Maroon and Amerindian groups have established co-op style businesses offering tour guide services. Typically, visitors take a prop plane to an isolated community with a grass runway, then transfer to a boat for the remainder of their journey. The price—roughly $730—often includes a visit to a local community, with traditional cuisine, a dance performance, as well as a few-nights stay in a rustic lodge and cabin along the Gran Rio River. For those looking for an “authentic” and “off-the-beaten-path” experience, these smaller operations deliver. Our guide asked the members of our small tour group to refrain from taking photos of the bare-breasted women who are walking among the low-slung West African style homes of the community we were visiting. He also reminded us to walk around, not through, the palm frond curtain that serves as the entrance to the community. (Walking through the curtain is a right reserved for members of the community.) A few women sat on the ground outside their homes and displayed their woven wares—mostly tablecloths—and children milled about. We looked at the goods, asked for permission to take photos of the kids, and shared in their delight when they saw their own faces in our viewfinders. For the most part, I am told, the people who work in these tourist-oriented programs are locals—after all, who would want to leave the relative comforts of the capital, where jobs are more abundant, for the jungle, where you might find a bushmaster snake in the corner of your room? 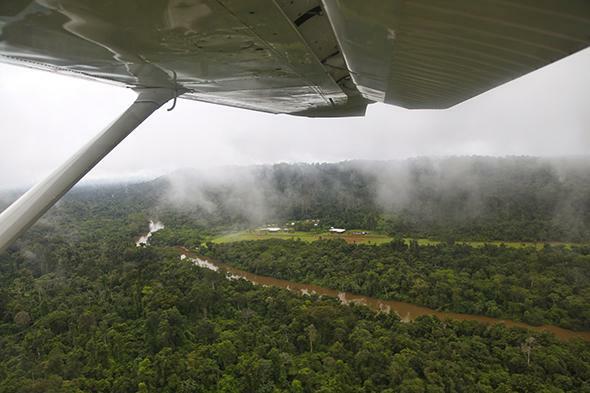 Flying over Suriname, you’ll see vast swaths of land like this: dense with trees, threaded by muddy rivers, interrupted only by a few properties that seem far from the rest of the world. At night, I retired to my cabin overlooking the river. I shook my bed sheets to scare off the scorpions that might have wandered up through the cracks in the floor. But as much as these and other creepy-crawlers might turn off some tourists, it’s the president’s own tarnished reputation that is probably the biggest threat to these community-based tourism enterprises. While I was in Suriname, news broke that the country’s parliament had passed a new law, the Surinamese Amnesty Act, granting Bouterse and 24 other suspects in the December Murders immunity from prosecution. The ever-defiant strongman has shrugged off calls from Amnesty International and the International Commission of Jurists to rescind the law. Bouterse’s son, Dino, has not been as fortunate when it comes to escaping prosecution for his crimes. He was arrested in Panama and turned over to U.S. officials in August. Among his charges: conspiring to import cocaine into the United States and more seriously, offering material support to Hezbollah to establish a permanent base in Suriname to aid attacks on U.S. targets. Having the president’s son prosecuted by the U.S. Department of Justice for supporting terrorists bent on killing Americans probably won’t be a boon for Suriname’s dreams of attracting North American tourists. Without its dictator at the helm, however, the possibilities for Suriname could be intriguing. Since the country has never had much of a public image, it can build its “brand identity” from the ground up. Suriname is a great blank slate, every tourism marketer’s dream. Frame that against the backdrop of a culturally rich and diverse country, with residents in far-flung communities living according to centuries-old traditions in untouched forests teeming with rare flora and fauna, and it’s hard to see why people wouldn’t come to Suriname. But that all assumes it can rid itself of the tyrant at the top—a problem that is hardly unique to this overlooked corner of the world.